Got Too Many Search Bars On Your Browser ? Have you noticed that you have too many Tool & Search Bars on your Browser ? These toolbars can block legitimate web sites and prevent you from getting information or material. Also, having too many plug-ins installed can significantly impact Internet Explorer's performance. You can get these Tool Bars & other Browser Extensions without even knowing it. To me, its nothing but Spyware. A lot of times you can`t uninstall them because they are not in the program logs, & running a Malware Scan doesn`t always find then ether. Here is a quick & easy way to remove the extra Tool Bars & to keep them from coming back on Windows 7. Open your Control Panel. Then open Internet options. Go to the Advanced Settings. 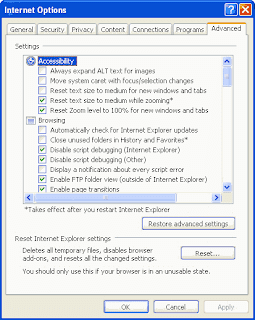 Find Enable Third Party Extensions. Leave it blank (unchecked). Then close the program. Now open your Browser. The go to Tools on the upper right of the Browser. Click Safety, then click Tracking Protection. As you can see in this photo a list of Add on Types on the top right. Click Tool Bars & Extensions. Now find those extra Tool Bars & remove them. You can remove the extra Search providers Also. You can also learn about how to block some Advertisers & other tracking tools to help with Spyware with the Tracking Protecting Software already embedded in your Windows 7. Last edited by FreaknDavid; 04-02-12 at 23:54. Re: Got Too Many Search Bars On Your Browser ? If that doesn't work, and you are a bit tech saavy, HijackThis is a good program to use as well, but you need to know what you are doing when you use it since it can do much more than removing browser helper objects. You could cause issues if you don't know what you're doing with it. Last edited by DMan999; 06-02-12 at 05:34.